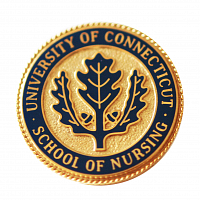 The Archives of Nursing Leadership is a joint program of the University of Connecticut School of Nursing and the Thomas J. Dodd Research Center. The archives acquires, preserves, and makes the accessible the papers and records of Connecticut Organizations that support the nursing profession and the personal papers of individuals who have made a significant contribution to nursing within the state. The archives offer an extraordinary opportunity to bring together in one location significant collections on the history of nursing from the state of Connecticut. Materials are available to both graduate and undergraduate nursing students at the University of Connecticut and are generally available for use by the scholarly community at large. Josephine A. Dolan, the first professor of nursing hired by Dean Widmer at the University of Connecticut, was an enthusiastic collector and writer of nursing history. Her papers include letters of Ella Louis Wolcott, a Connecticut native, who served as a nurse during the American Civil War and whose correspondents included nursing pioneer Dorothea L. Dix. Dolan’s papers also include material on early nursing schools and organizations, historical information on nursing leaders, and records of her personal career and involvement with nursing education and nursing history. Learn more about the collection at the Dolan Collection web page. Established in 1873, the Connecticut Training School for Nurses offered the first training program for nurses in the state. Many of the early leaders of the state’s nursing profession studied there before the school closed in 1926. These materials record the activities of the school’s graduates and include minutes of the association’s meetings (1891-1964), annual reports, correspondence, and financial records. Virginia Henderson was an international leader of nursing and nursing education. A prolific writer, she authored Principals and Practice of Nursing and the Nursing Studies Index, both standard reference works for nurses and nurse educators. She taught at the Teachers College at Columbia University, was a research associate at Yale University, and was known throughout the world as a writer and scholar. Her research library is part of the Archives of Nursing Leadership. The North East Organization for Nursing (NEON) was an organization of nurses from Massachusetts, Rhode Island, and Connecticut that functioned as a regional coordinating and communications body. Its records (1984-1995) include minutes, correspondence, and newsletters.